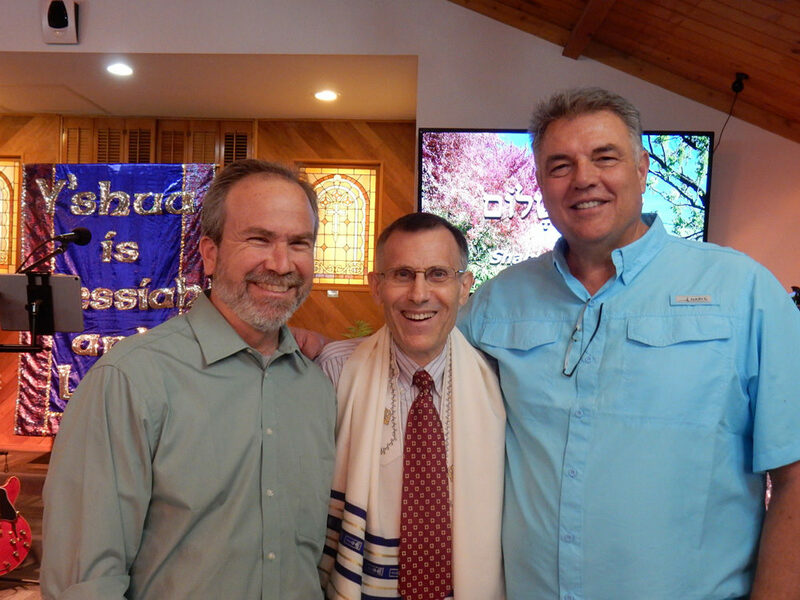 We are a Messianic Jewish congregation who believes that Yeshua (Hebrew for Jesus) is the promised Jewish Messiah. We provide a Messianic congregation where those who are Jewish or have families who are Jewish can continue to live out their Jewishness but with faith in Messiah Yeshua. Also we provide an opportunity for both Jews and non-Jews alike to learn about the Jewish basis of our faith in Yeshua. As well, we provide a gathering for those with a love for our Jewish people and the modern day state of Israel and who want to see them be blessed by coming to know and follow Messiah Yeshua. We have three elders who are responsible for spiritual oversight of the congregation. Michael H. Brown came to Adat Y'shua in 1992 as Messianic Pastor. He is from a Reformed Jewish background and is a graduate of Dallas Theological Seminary with a ThM (Master in Theology). Michael Cohen, is also a Pastor and is the LA Director of Chosen People Ministries. He has been involved with Adat Y'shua since he came to believe in Yeshua in 1993. He is from a Conservative Jewish background and is a graduate of Moody Bible Institute with a Master of Arts in Jewish Studies. Joel Vasile is a worship leader with Jewish heritage but was not raised Jewish, and has his own Automotive Repair business in Burbank. We also have Deacons and Deaconesses, and leaders of various ministries who assist the Elders. Reach people for Messiah Yeshua (Kiruv) to the Jew first but also the Gentile, both locally and beyond. Develop mature, reproducing Messianic disciples (Talmidut) in community with one another and in Havurot. Establish a vibrant, worshipping, Messianic community (Mishpochah) under the New Covenant (B’rit Hadashah) which is a witness and minister of good works for Messiah Yeshua in society. To be a gospel-centered, Havurah planting, Messianic congregation under the headship of Yeshua, that is elder-led, community-driven, and organized by the gifts of the Holy Spirit, in order to make disciples, one in Messiah, who proclaim the Gospel of Yeshua to the Jew first and also the Gentile for the glory of God. We are a “one new man” community composed of Jewish and non-Jewish believers in Messiah Yeshua that celebrate the Jewish festivals and lifecycle events with worship on Shabbat. We worship Yeshua and not Jewishness. We believe Jewish and non-Jewish believers are equal in our community. Adat Yeshua is an outgrowth of a weekly bible study meeting back in the 1980’s by Jews for Jesus in the San Fernando Valley. Adat Yeshua was organized as a separate, independent Messianic Jewish congregation on May 6, 1988. The congregation met in Van Nuys for its first 8 years, then met in Woodland Hills for 12 years, and since then has met in West Hills. We believe: that the Scriptures of the Tanakh and B’rit Hadasha [= Old and New Testaments] are divinely inspired, verbally and completely inerrant in the original writings, and of supreme and final authority in all matters of faith and life. We recognize: the value of traditional Jewish religious literature, but only where it is supported by, or conformable to, the Word of God. We regard it as in no way binding upon life or faith. We believe: in one sovereign God, existing in three persons: Father, Son and Ruach HaKodesh [= Holy Spirit], perfect in holiness, infinite in wisdom, unbounded in power, and measureless in love; and that God is the source of all creation and that, through the immediate exercise of His power, all things came into being. We believe: that God the Father is the author of eternal salvation, having loved the world and given His Son for its redemption. We believe: that Yeshua [= Jesus] the Messiah was eternally pre-existent and is co-equal with God the Father; that He took on Himself the nature of man through the virgin birth, so that He possesses both divine and human natures. We believe in His sinless life and perfect obedience to the Law; in His atoning death, burial, and bodily resurrection, ascension into heaven, high priestly intercession, and His personal return in power and glory. We believe: that the Ruach HaKodesh is co-equal and co-eternal with the Father and the Son; that he was active in the creation of all things, and continues to be so in providence; that He convicts the world of sin, righteousness and judgement; and that He regenerates, sanctifies, baptizes, indwells, seals, illumines, guides and bestows His gifts upon all believers. We believe: that God created Man in His image; but that because of the disobedience of our first parents in the Gan Eden [= Garden of Eden], they lost their innocence and both they and their descendants, separated from God, suffer physical and spiritual death; and that all human beings, with the exception of Yeshua the Messiah, are sinners by nature and practice. We believe: that Yeshua the Messiah died for our sins, according to the Scriptures, as a representative and substitutionary sacrifice; that all who believe in Him are justified, not by any works of righteousness, but by His perfect righteousness and atoning Blood; and that there is no other name under Heaven by which we must be saved. We believe: that Israel exists as a covenanted people through whom God continues to accomplish His purposes, and that the Body of Messiah [ = Church] is an elect people in accordance with the B’rit Hadasha [= New Covenant], comprised of both Jews and Gentiles who acknowledge Yeshua as Messiah and Redeemer. We believe: that Yeshua the Messiah will return personally in order to consummate the prophesied purposes concerning His Kingdom. We believe: in the bodily resurrection of the just and the unjust, the everlasting blessedness of the saved, and the everlasting punishment of the lost.